Please Note: Price of the book includes Delivery Charge Rs. 45. ..
Part A : Income Tax Laws Basic Concepts o Income Tax Laws Computation of Inco.. 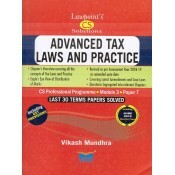 This is an excellant textbook on Advanced Tax Laws and Practice for CS Professional June 2017 Exa..